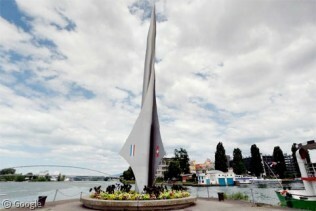 Today is the start of Geography Awareness Week in the US, and as we’re rather fond of geography here at Google Sightseeing, what better way to celebrate than with a look back at some of the geographically special (or weird) locations which we’ve visited over the years, beginning with the dreiländereck (Photosphere by Michael H Quade) in Basel which marks the tripoint where Switzerland, Germany and France meet. We looked at a few such locations in A Trio of Tripoints. Other geographically-significant posts that are worth revisiting are Interesting US Exclaves and Landlocked Enclaves, Quirky Border Towns and Complicated Borders, Island and Lake Recursion, and the Struve Geodetic Arc. However, on occasion we have been known to take a more light-hearted look at geography, with for example the top tens of Confusing Place Names and rudest place names in Britain, Canada and America.